Value stocks aren't what they used to be in the days of Benjamin Graham. Investing for value is one of the first things any investor should learn. It's the type of investing Benjamin Graham and his disciple Warren Buffett teach, and the strategy has many followers. 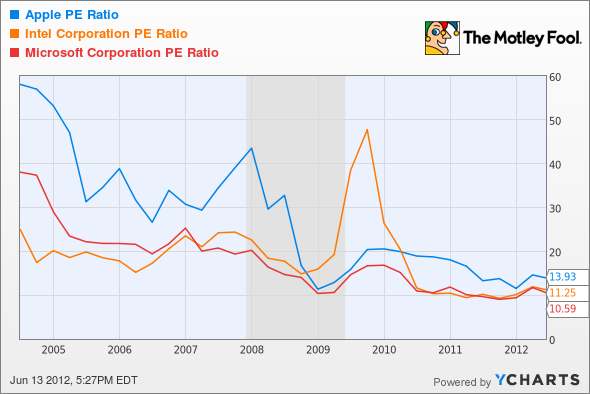 Value stocks have traditionally been highlighted by low price-to-book values, low P/E ratios, and a high margin of safety for investors. If all goes wrong, the company could be sold for parts, leaving investors with the book value and hopefully at least their money back. As some of the teaching goes, investors should look for price-to-book values of close to 1 for a strong margin of safety. But as the economy has changed from a capital-intensive economy driven by manufacturing to a service-based economy driven by technology, the companies on the stock market have changed, and so should our perception of value. Stocks with book values at or below 1 exist these days, but they aren't the everyday stocks we know and love. Berkshire Hathaway (NYSE: BRK-B) trades just above 1.1, but Buffett is one of the few who grades himself on growth in book value these days. You can still find many banks trading near book value, but who knows what's on their balance sheets these days. In light of new market trends, I think there is a new breed of value stock emerging: A group of stocks that were once the growth giants of the market yet now are among its best value opportunities. Four stocks that I think are great value stocks -- three of which I have bought myself -- are Apple (Nasdaq: AAPL), Intel (Nasdaq: INTC), Cisco (Nasdaq: CSCO), and Microsoft (Nasdaq: MSFT). These companies are titans in the tech industry, and they provide great values to investors. Dividend yields range between 1.9% and 3.2%, each carries a substantial cash hoard, and trailing P/E ratios are approaching or below single digits when you account for net cash on the balance sheet. Each of these companies has strong enough positions that they aren't going to disappear overnight, making their price attractive to investors looking for value in their portfolios. As these stocks have gone from strictly growth stocks to value stocks, their price-to-earnings ratios have tumbled, and I would contend that they can't fall much further. Apple is the largest publicly traded company in the world, but it has yet to run into the law of large numbers that usually accompanies such a large size. In its most recent quarter, Apple grew revenue at 58.9% and still ended with $110 billion in cash and investments with no debt on the balance sheet. Graham wasn't talking about a hoard of cash like that or a loyal following like the one Apple has when he said investors need a margin of safety, but that kind of growth from a company with a 13.9 P/E ratio is exactly the kind of margin of safety we should look for today. Intel was once a darling of the stock market, but in recent years, it can't seem to garner much attention or a premium of any kind. Part of the problem is Intel's slow move into the mobile market, but Intel still dominates PCs, and revenue has grown 15.6% annually over the past three years. Combine that with the fact that it pays a 3.2% dividend, consistently beats analyst estimates, and has an incredible 23.1% profit margin, and I think an 11.0 P/E ratio is a steal for the world's dominant chipmaker. Microsoft isn't the bully it once was when it was crushing competitors, taking market share, and growing like a weed. But Microsoft still commands an amazing share of the market in PCs and business software and is incredibly profitable. If there's one company on this list that has an impenetrable moat, it's Microsoft, which dominates the PC operating system and office-software markets, which won't die even as we move toward a more mobile market. Over the past five years, revenue has grown at 6.8% and earnings per share have grown at 13.8%, even as Apple steals the thunder Microsoft once had. A cash hoard of nearly one quarter of the company's market cap should help investors sleep well at night, while a 10.6 P/E ratio and 2.7% dividend help make Microsoft the stock that I think is the best value on this list. Last, but not least, Cisco provides the hardware that makes the Internet and business work. Cisco has seen growth slow in recent years as competition has entered the market, but that doesn't mean it's a bad stock for investors. Net cash of $32 billion is more than one-third of the company's market cap, and the stock trades at just 10 times 2012 earnings estimates. Through its challenges, Cisco has still been able to grow a modest 4.9% over the past five years, and with an earnings multiple that low and a pile of cash, it's hard not to see Cisco as a value. Buffett and Graham were looking for a different kind of value stock in their day, but I think a lot of cash, high dividend payout, low P/E, and strong market position make a great value stock today. In the spirit of backing up our predictions, I'm making a CAPScall on each of these four stocks, adding an outperform rating in My CAPS portfolio. Follow the rest of my picks. What stock do you think is the best value on the market? Let me know in the comments section below, and check out our free report highlighting three more dividend stocks investors should take a look at. The report is absolutely free.